We are excited to share the great news and congratulate 7 Hills Brewing Company, out of Dubuque, IA, as they received the Iowa Green Brewery Certification earlier this month. 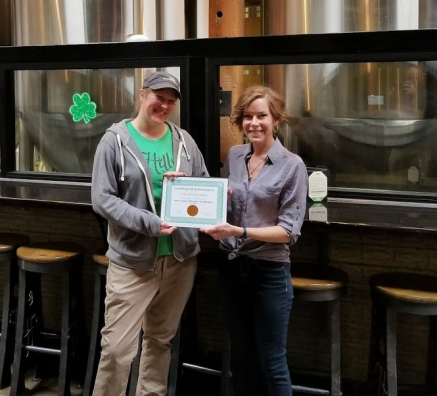 They are the first Dubuque craft brewery to be added to the program and Megan Carter, General Manager of 7 Hills, (pictured on the left) accepted the certification for their bronze level achievement. 7 Hills had already taken steps to implement several waste reduction initiatives. They have tracking mechanisms in place for items including energy, water, and their inventory. They also have installed several high-efficiency systems including appliances and water heaters; also installing motion sensors and timers on their energy efficient lights. “It is very clear that 7 Hills has a passion for sustainability. They have implemented several great systems and strategies and continue to proudly craft their brews with waste reduction in mind." says Joe Bolick, project manager for the certification program. 7 Hills Brewing Company joins Keg Creek Brewing Co. (Glenwood), Lark Brewing (Waterloo) and SingleSpeed Brewing (Cedar Falls) at the silver level, with Franklin Street Brewing Company (Manchester) at gold, and SingleSpeed Brewing (Waterloo) at platinum in the award-winning certification program. The certification program, now into its second year, provides assistance to Iowa craft breweries looking to comply with environmental regulations as well as engrain sustainability and waste reduction into their brewing process. Congratulations to 7 Hills Brewing Company on receiving the bronze certification, and welcome to the Iowa Green Brewery Certification program! Are you curious what the Iowa Green Brewery Certification is all about? You can learn more here.